Garion was an orphan boy living on a farm with his Aunt Pol when Mister Wolf a kindly, old traveler - took the two of them on a quest to retrieve a stolen object of great value. Mister Wolf turns out to be Garion's grandfather the ancient sorcerer Belgarath; and the stolen object turns out to be a magical orb forged by the god Aldur, and stolen by his brother Torak, who now lies asleep for centuries after the orb was re-captured by Belgarath. Prophecies surrounded the orb, including one that foretells a battle to the death between Torak and Garion (now renamed Belgarian). The 5-volume epic fantasy The Belgariad by David Eddings follows the trio and companions they gather along their quest to both liberate enslaved lands and to fulfill the prophecies of the orb. Although the prophecy predicts a death battle between Belgarian and Torak, it does not predict the outcome of this battle. Along the way, they pick up the runaway princess Ce'Nedra, with whom young Belgarian has a love/hate relationship. With 5 volumes to work with, Eddings does a good job of weaving a story of adventure and building a cast of characters and a relationship between those characters. The Belgariad is a coming-age-story for Belgarian, and also a coming-age-story for Ce'Nedra, who grows from spoiled princess to potential monarch in the latter two novels. Belgarian discovers himself, his magical abilities, and his destiny as he travels across the world fighting evil. Each book begins with a brief story of the old gods and their battle for the orb during ancient times. This story is told in a more formal voice (as if read aloud from an ancient codex) than the rest of the book, which focuses on the story of Belgarian and his company. The story is much less complex than the Lord of the Rings (from which it draws obvious inspiration). The wizard-led fellowship traveling across a dangerous world of fantastic beasts and pitting magic against magic is similar enough to Tolkein's story, that I could not help reading the part of Belgarath in the voice of Ian McKellan. But Eddings makes The Belgariad original enough and adds enough action to hold my interest throughout. My only complaint is how little time is devoted to the final, inevitable battle between Belgarian and Torak. We wait for it for 4.9 books and it is over too quickly. It's not a classic, but The Belgariad is definitely worthwhile and is an enjoyable story set in an interesting world. Last week, I took my son to his first jazz club. We saw Benny Golson at the Jazz Showcase in the South Loop. He liked it. Golson has been performing tenor saxophone publicly for decades and has accumulated a number of stories of his interactions with many of the all-time greats - from Dizzy Gillespie to Eric Burdon. He spent much of this evening telling of his days with other musicians, preceding each song with the tale of how that song came to be. For example, he spoke of writing "I remember Clifford" after learning of the death of his friend Clifford Brown; and he talked about playing "Whisper Not" for Dizzy Gillespie and trying to remain cool after Gillespie asked if he could record the song. At 85, Golson is showing his age. He no longer has the stamina to maintain the long slow notes that many of his melodies demand. But on this night in Chicago's South Loop, he surrounded himself with some excellent musicians (piano, upright bass, and drums), who made up for that with their solos. And Golson is best known for his songwriting prowess and nearly every song he performed was his own composition. And his melodies are still lovely. And my son enjoyed his first jazz concert. 30 years ago, I received as a gift the album "Nelson Mandela" by Youssou N'Dour. I was hooked. N'Dour exposed to me an engaging style that combined traditional rhythms of his native Senegal with western instruments. Thursday night at Millennium Park, I finally had the chance to see N'Dour in concert. He did not disappoint. Throughout the show, everyone smiled and danced to the music. 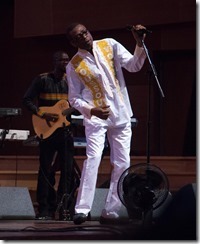 The audience enjoyed themselves, Youssou enjoyed himself, and the band enjoyed themselves. Except for the rhythm guitar player, who remained stoically stone-faced throughout the performance, despite being surrounded by smiling musicians and fans. N'Dour shared the stage with about a dozen other musicians, including two keyboardists, 3 guitarists, 4(!) drummers, and 1 dancer. They played danceable Afro-pop for over 90 minutes and came back for an encore to the delight of the crowd. The show was a treat for those of us who love African music. Next to the stage, I saw people dressed in African garb dancing to the music. A few rows back, I saw middle-aged white Americans tapping their feet. 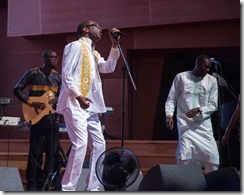 Even though none of the songs were sung in English, Youssou and his band made a connection with an audience far from his homeland. By the end of the show, even the rhythm guitarist had to smile. Today I am grateful to attend my first PubConf last night. Today I am grateful for my first time speaking at #KCDC. Today I am grateful to meet so many old friends in Kansas City last night. Today I am grateful for the past, present, and future MVPs who contribute so much to our community. Today I am grateful to watch Game of Thrones each week with my son. -a drink last night with Tim at the new outdoor café across the street. Today I am grateful for the International Nodebots Day workshop yesterday. Today I am grateful to spend a day with my team. Today I am grateful I was able to help people multiple times yesterday. Today I am grateful for a chance to sleep in this morning. Today I am grateful for an afternoon at Warren Dunes State Park. Today I am grateful for a week in Las Vegas with Microsoft folks from around the world. Today I am grateful for a gondola ride yesterday with Jennifer and Matt. Today I am grateful to see Lenny Kravitz and Ellie Goulding in concert last night. Today I am grateful to reconnect with so many colleagues yesterday. Today I am grateful for honest conversations. Today I am grateful for the year that we had together. Today I am grateful that Thad and I saw Pharez Whitted in concert at the Jazz Showcase last night - my first visit to the club. Today I am grateful for a Pakistani dinner with Raj last night. Today I am grateful to meet so many students and entrepreneurs from Africa yesterday. Today I am grateful to the organizers, volunteers, speakers, and attendees of the first Detroit.Code() conference for making the event a success. Today I am grateful to see so many friends last night in Detroit. Today I am grateful for a visit from my son Nick this weekend. Today I am grateful to attend a Cubs game last night with Nick and Tim. Today I am grateful to go to the gym and dinner last night with Tim. Today I am grateful for lunch with Ondrej yesterday. Today I am grateful for the hospitality and generosity of Kevin and Judy, who opened their home to me.